Cookbook honors, in addition to his award-winning Gorji Gourmet Foods™ sauce line, add to Chef Gorji’s culinary legacy. Zing! By Gorji Cookbook is USA Book News award winner in the International category. 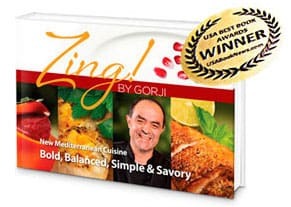 DALLAS, TX—Gorji, chef-owner of Canary By Gorji restaurant in Dallas,TX has received top book awards from members of the established independent publishing awards community with his first-ever cookbook, Zing! By Gorji – New Mediterranean Cuisine. It is part innovative cookbook, part autobiography and part guide to great culinary shopping tips and methods for creating “New Mediterranean cuisine” including how to use ingredients such as pomegranates, barberries, limes and sumac to infuse dishes with bold flavor. To date, Zing! By Gorji cookbook has taken home five top awards in book publishing contests, four in cookbook categories and one for best book/author/publisher website. Recognizing authors that put their heart and soul into their work, the National Indie Excellence® Awards is proud to be a champion of self-publishers and small and independent presses that go the extra mile to produce books of excellence in every aspect.”Awarded since 2007, the competition is judged by independent experts from all aspects of the indie book industry, including publishers, writers, editors, book cover designers and professional copywriters. USA Book News Award winners and finalists have traversed the publishing landscape including Simon & Schuster, Penguin, John Wiley & Sons, Houghton Mifflin Harcourt, Kensington Books, Harlequin, McGraw-Hill, Llewellyn, Yale University Press, Cornell University Press, University of Missouri Press, White House Historical Association, American Bar Association and hundreds of independent publishers. This year’s USA Book News contest had more than 2000 entries for titles. The London Book Festival awards titles in English, Spanish, French, German, Portuguese, and Italian. Published, self-published or independently published authors, they span a wide variety of genres.The panel of judges chooses winners based on an author’s story-telling skills and his/her work’s ability to gain international acclaim. The 19th annual Independent Publisher Book Awards honor the year’s best independently published titles from around the world. This year’s contest drew over 2,750 entries from authors and publishers in 45 U.S. states, six Canadian provinces, and 10 countries overseas. No Replies to "Zing! By Gorji Sweeps Indie Book Awards"